Ogden on Politics: Isn't It Time the NFL Pays Taxes? Isn't It Time the NFL Pays Taxes? ... I did not know that the National Football League, the colossus of professional sports, is classified as a non-profit — a tax-free non-profit, to be more specific. That’s right: The NFL has its own exemption, written into federal law, that makes it exempt from federal corporate taxes. The Professional Golf Association and the National Hockey League, among others, enjoy a similar exemption although in their cases, it is not an exemption specifically written into the law. 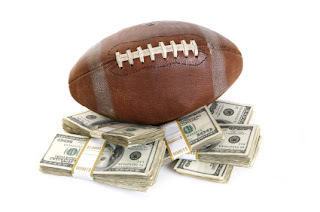 In 2010, the registered NFL nonprofit alone received $184 million from its 32 member teams. It holds over $1 billion in assets. Together with its subsidiaries and teams – many of which are for-profit, taxed entities – the NFL generates an estimated $9 billion annually.... Almost half of professional football teams are valued at over $1 billion…. League commissioners and officials benefit from the nonprofit status of their organizations. Roger Goodell, commissioner of the NFL, reported $11.6 million in salary and perks in 2010 alone. Goodell’s salary will reportedly reach $20 million in 2019. Steve Bornstein, the executive vice president of media, made $12.2 million in 2010. Former NFL commissioner Paul Tagliabue earned $8.5 million from the league in 2010. The league paid five other officials a total of $19.2 million in just one year. In comparison, the next highest salary of a traditional nonprofit CEO is $3.4 million. The NFL’s exemption stems from a 1966 law, passed at the time of the merger with the old American Football League, specifically allowing “professional football leagues” to enjoy 501(c)(6) status as tax-exempt trade organizations. Other leagues have piggy-backed on that legislation to claim that status themselves. The article doesn't mention it, but the NBA is also classified as a tax exempt, non-profit organization. The Pacers play in an arena exempt from property tax because it is technically owned by the Capital Improvement Board. Although the public have paid to run the place to the tune of $10 million a year, the Pacers receive 100% of the revenue from the building. “There are 47 percent of the people who will vote for the president no matter what … who are dependent upon government, who believe that they are victims. … These are people who pay no income tax. … and so my job is not to worry about those people. I’ll never convince them that they should take personal responsibility and care for their lives.” -Mitt Romney. SOOO, The NFL is a part of the 47% that do not pay Federal Taxes??? The Leadership of the NFL would seem to be in the 1%. And major league baseball is exempt from anti-trust regulations, the NCAA is non-profit, the NBA is tax exempt as well. For whatever reasons sports receive a pass on a lot of things that the majority of us have to endure. The NFL won't pay taxes because it is a part of the government and serves an incredibly useful military, educational, normative and conformist role. The government could never hope to conjure a program that serves to create obedience and tribalism as well as the NFL does. A little tax break is a small price to pay for such a huge benefit.